Among cellphone users, longer articles – those that are at least 1,000 words – tend to have a somewhat longer life span than shorter ones, though for both the life span is remarkably brief. 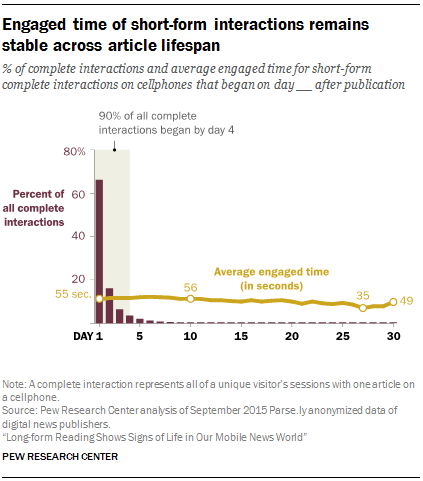 To examine this, we looked at the time between an article’s publication date (for articles published in September) and each cellphone user’s initial visit to that article. Fully 82% of interactions with short-form articles began within the first two days after publication, as did 74% of long-form interactions. By day three, that rises to 89% of short-form interactions and 83% of long-form interactions. 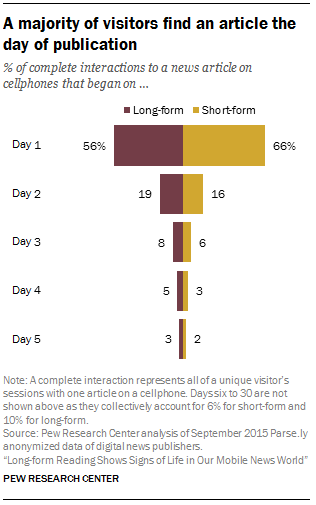 Indeed, just 6% of short-form interactions and 10% of long-form interactions began more than five days after an article was published. This small portion of users who find these articles later tend to spend about the same amount of time – and in some cases more time – with them. The total time spent with short-form news (fewer than 1,000 words) hovers around 58 seconds throughout the first 10 days after publication. After day 11, average engaged time slowly drops off until it reaches a low of 35 seconds on day 27 before a slight uptick through the remainder of the month (although there are fewer than 100,000 interactions during the last few days). 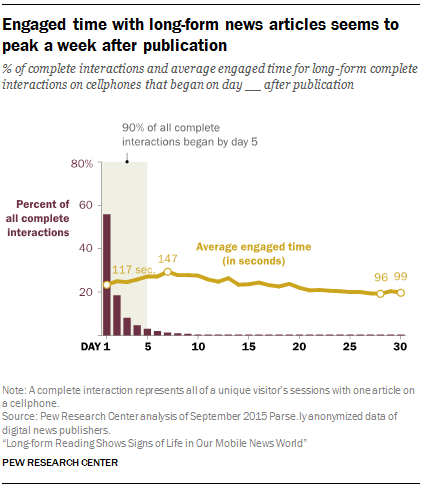 Time spent with longer news stories on cellphones shows somewhat more fluctuation. 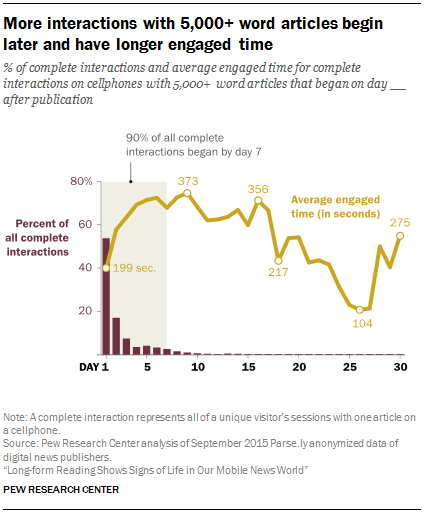 In the first week after publication, the average time cellphone users spent with a given article steadily increased, from 117 seconds on the first day of publication to 147 seconds on day seven. But engaged time then steadily declined, falling to 96 seconds on day 28 before a slight uptick for the remainder of the month. The trend of increased engaged time during the first week after publication is even more pronounced for articles that are 5,000 words or longer. For these news stories, average engaged time increases from 199 seconds the day of publication to 373 seconds 8 days later, an increase of 87%. After this point, average engaged time becomes more erratic, as the number of visitors drops below 10,000 each day. The data do not speak to why average engaged time peaks later for long-form articles than for short-form articles. One possible explanation is that the small portion of users that visit an article much later may be highly interested in the article’s topic and thus spend more time with it.